New free trade deals across regions such as the Transpacific Partnership Agreement, Transatlantic Trade and Investment Partnership, and Trade-in-Services-Agreement, among many others are being negotiated that will have far-reaching implications for peoples in both the global North and South and for the future of the world economy. But these deals will neither benefit the democratic majority nor rescue the world economy in crisis. These deals are in fact tailored to fit the ever expanding demands and interests of big multinational corporations. These deals are often advertised as “partnerships,” but they are far from partnerships of equals. They are being managed and directed by the global corporate elites, the United States, and the European Union. 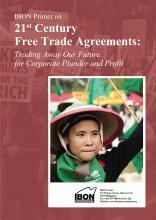 The new free trade agreements are being negotiated in secret. But what exactly are they hiding away from public scrutiny? This new IBON International primer reveals that advanced industrial countries are attempting to revive their unfinished liberalisation and decontrol agendas. These include new and expanded rules on services, regulations, competition, investment, and investor protection. These policy proposals will lead to the further concentration of wealth and power in the hands of big corporations while rolling back the important gains achieved through people’s collective assertion of their rights including policies to ensure workers’ welfare, regulate corporate behaviour, and protect the environment. Download a copy of the primer here.